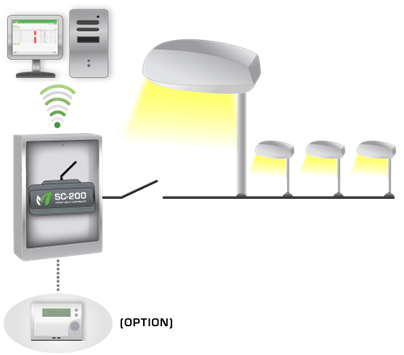 GreenStreet Basic is a complete streetlight system of the conventional type where the streetlight controller SC-200 turns on and off several independent groups of light points. Included in this solution is a web based control and management software – GreenStreet Vision – which is used to remotely control, monitor and administrate lighting systems. For instance, data from a light sensor can be used by GreenStreet Vision to decide when to issue turn on and turn off commands to all or a group of street cabinets. This system can also provide information about on and off times, burning hours, energy consumption and various types of alarms. GreenStreet Basic is an excellent alternative when the control system in the street cabinet is due to be replaced. The system package includes all the functions expected of a modern conventional control system for streetlights. A key advantage of the GreenStreet system is that dimming functions and extra monitoring options can easily be added at a later date. GreenStreet Basic can be complemented with an electricity meter to report real energy consumption as well as the general status of the electricity grid. Furthermore, the street cabinet can be complemented with separate alarm modules for extended remote monitoring, as well as separate light control units if more than three groups are to be controlled independently.